When it comes to seasonal plants, mums are a fall staple. Mums come in a variety of shapes and colors, making it easy to add distinctive flair and style to your home garden this season. Below are several ways you can take care of your mums this autumn. If you have a potted mum, look at the root system of your plant. If it’s been a while since you last re-potted your mom, you will want to transfer it to a bigger container so the root can expand, rather than compact and cut off nutrients. This will revitalize your plant and ensure that it will stay blooming for several weeks. Take the mum out of the pot, give it a good shake down, and separate any roots that seem to have compacted together. If you have your Mum in a pot or container, I’d recommend placing it on a windowsill or somewhere it can get sun, since these plants do well with a lot of sunlight. To care for your mum in the ground, make sure it’s getting 6 or more hours of sunlight daily. 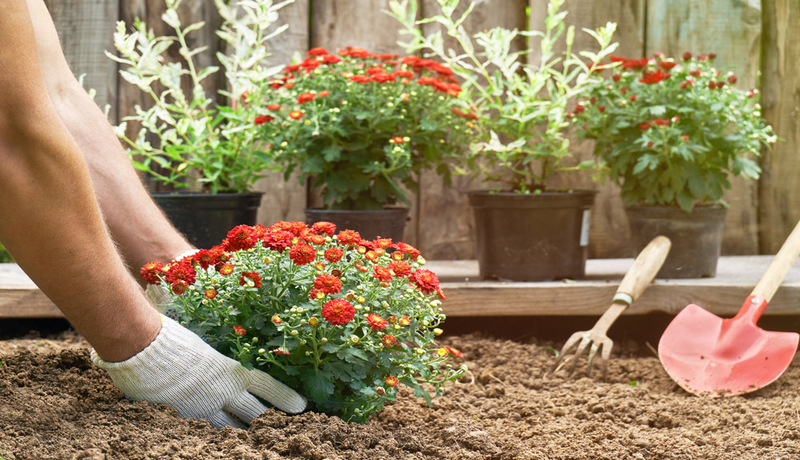 Make sure you’re watering your planted mums often because they can wilt and get dehydrated easily. If you’re mum is wilting then you’re not watering it often enough. For the planted mum and the mum in a container, you’ll want to make sure that the soil isn’t too compacted. Plants need the soil to drain quickly, add drain holes to the container if there aren’t any already. In the garden, make sure that they aren’t planted too closely to others as they don’t do as well when in “competition” with other plants nearby. Enjoy your Mums this fall season!